Duck Souls is a fast-paced, action platformer from Green Dinosaur Games. It is about a little duck with an incredible skill to dash and a mission, find all the eggs to save his especies. The game is set in cute and deadly fantasy world, where many traps will try to cut your wings off your body while you struggle to find all lost eggs, and keep your especies alive. Run, jump and dash throught a colorfull and treacherous enviroument to save everyone and become a hero. Play 100 lovelly hand-crafted levels filled with deadly traps and random references. Jump over spikes, climb walls and avoid the death with ease, optmized controls for gamepads and keyboards. 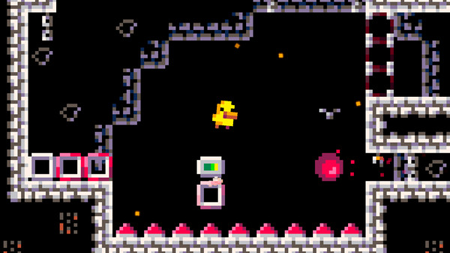 There’s no fighting in Duck Souls, so you’ll have to rely on your speed, reflexes, and dashes to survive. There are 20 types of traps ready to cut you in half, keep running and dashing. There are 20 different hats for you to collect and custumize your Duck. If you get stuck in the game, check out the video walkthrough and gameplay for the game. This entry was posted in PC Games, Walkthrough and tagged Duck Souls Cheats, Duck Souls Game, Duck Souls Gameplay, Duck Souls Guide, Duck Souls Hints, Duck Souls Review, Duck Souls Solutions, Duck Souls Strategy, Duck Souls Tips, Duck Souls Walkthrough by Marvin. Bookmark the permalink.